Melville Louis Kossuth Dewey (1851-1931), was an American librarian, entrepreneur, womaniser, spelling reformer and inventor of a decimal-based system for the organisation of knowledge in libraries. He divided all knowledge into ten broad subject areas, such as science 500-599; divided each of those areas into ten, such as animals 590-599; divided each of those into ten, such as 598 birds; and so on, such as 598.9 raptors. Whether it’s books, reports or cdROMs, you can assign them a Dewey number, and all the items on similar subjects in your library and its catalogue come together. As the meerkat (599.742) says, “simples”. 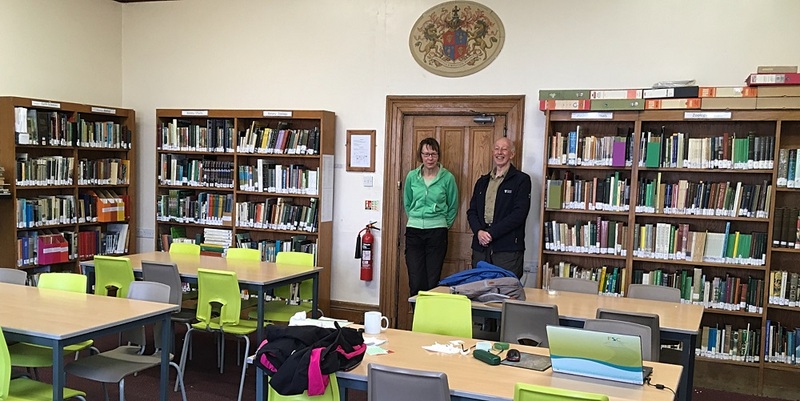 Siiri, a member of FSC staff and a librarian from Estonia, and her librarian husband Nigel, worked on the Preston Montford Library during 2016. Much of it was already Deweyfied, albeit inconsistently. Our work was to clean up the past catalogue and the stock as much as possible. This meant far more than changing some Dewey numbers. The catalogue’s listing of titles, authors, editions and copies contained many errors and inconsistencies. As in all libraries, some items had gone missing over the years. Some had been updated by newer editions, and some were just disintegrating. 2,501 titles were catalogued electronically to international standards, and the catalogue is now available to all at Preston Montford. Whether looking for something on flood management, bryophytes or mustelids, you have a good chance of finding it in the library. This year we returned to catalogue the Invertebrate Challenge Collection in the Wenlock building. This had not been fully catalogued, and being research-based, was more specialised than much of the Library collection. Part of the librarian’s skill is to know a little about a lot, so we gradually began to understand the differences between the odonata (595.733), trichoptera (595.745) and coleoptera (595.76). At 595.77, the impressively numerous types of diptera left us in awe of nature’s fecundity and ability to find adaptive niches. As non-biologists, we discovered the splendidly-named pseudo-scorpion (what is natural selection doing there?) and the broad-nosed weevil, and the privilege of being allowed by a volunteer researcher to view of the hairs and hooks on a springtail’s legs down a microscope. The taxonomic reassignment of organisms is reflected by newer versions of the Dewey scheme. Thus the annelids have been moved from 595 to join the simpler invertebrates at 592. Protozoa, no longer being considered animals, have moved from 593 to 579, a home for refugees exiled from botany and zoology. To retain consistency with older items in the main library, we retained use of the older numbers; finding items on the same subject together is more important than taxonomic niceties. We also detected the possible bias of biologists to more attractive species: books and reports abounded on butterflies, caddis flies and snails, but there was little on fleas, mites, dung beetles or slugs. 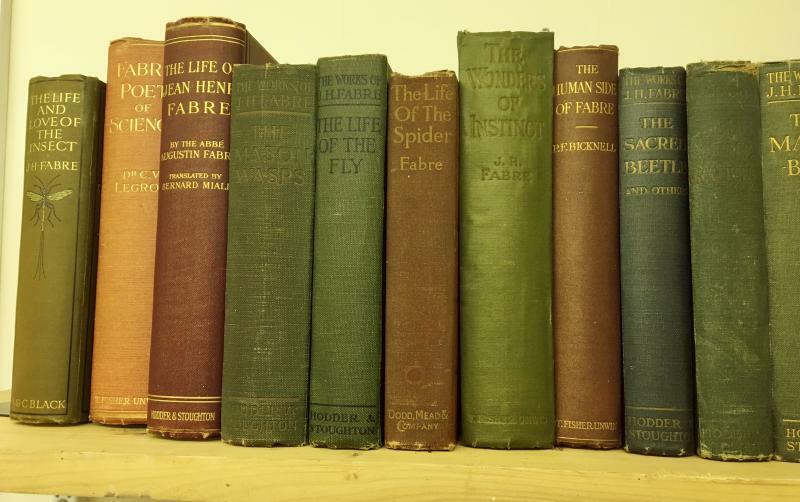 The Collection contains a shelf of books by and about the great French entomologist, Jean-Henri Fabre (1823-1915). These are bound in the cloth covers of the time, many inlaid with their titles and illustrations of their content picked out in gold. The heat-taped and spiral-bound, paper scientific reports of more recent times seem flimsy and ephemeral in comparison. 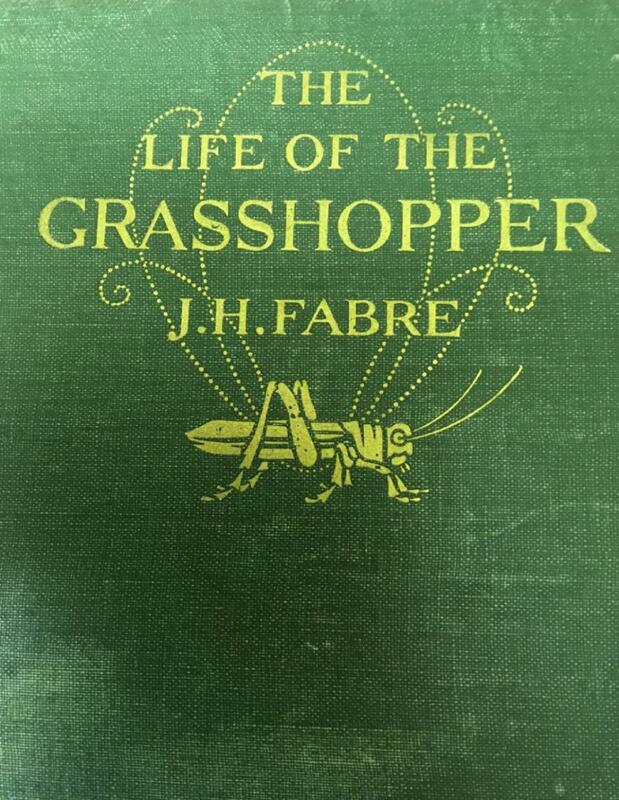 The Invertebrate Collection has just over 400 titles. Its strength lies in being focused on invertebrates, and particularly insects. It has a greater proportion of more recent material than the main library. The main library has relied considerably on donation, and therefore reflects the enthusiasms and specialisms of donaters as much as systematic coverage of field studies. The Collection also has multiple copies of the FSC and similar core guides, suitable for use in courses. Collection items are in green in the catalogue. So what is the value of a traditional library today to an organisation such as the Field Studies Council? Can past and present media be integrated in a useful way? Fundamentally, libraries and information storage are about users: you. Shelves of fine old books look nice, and we can feel warm and nostalgic about them, but if they are hardly ever used, we must ask why are we keeping them? They are taking up space and resources that might be better used. Whilst they contain timeless material (think of the New Naturalist series from the 1950-60s), they also include outdated information. Electronic media have currency, immediate and remote accessibility, and easy portability into teaching and other documents. Serials (periodicals) and scientific reports are now frequently only available in electronic format. Yet, we became very aware of the wealth of engaging material to be found among the older items, and older can be right up to the 2000s. In addition, far from all material is published electronically even now, particularly small-scale but important, localised research. Electronic media are becoming ever more astounding and flexible, but just remember how frustrating it can be on a field trip to find you have a flat battery or no mobile signal. Then the durable, waterproofed FSC mini-guides really come into their own! The newly revised catalogue can contribute to integrating older and newer resources: we have ensured that book and report titles are given more fully and precisely, helping you to spot the potentially useful item. Whilst course teaching and focused research inevitably lead to purposive literature searching, there is still a role for browsing catalogues and along library shelves. Thanks to Dewey, material on quite specific subjects from over a hundred years of publishing is brought together to inspire and compare. Centre staff and users need to find the time to explore the shelves. You can of course borrow items to read at leisure. We followed up our work at Preston Montford by spending two weeks in March cataloguing the library collections at Malham Tarn Centre. 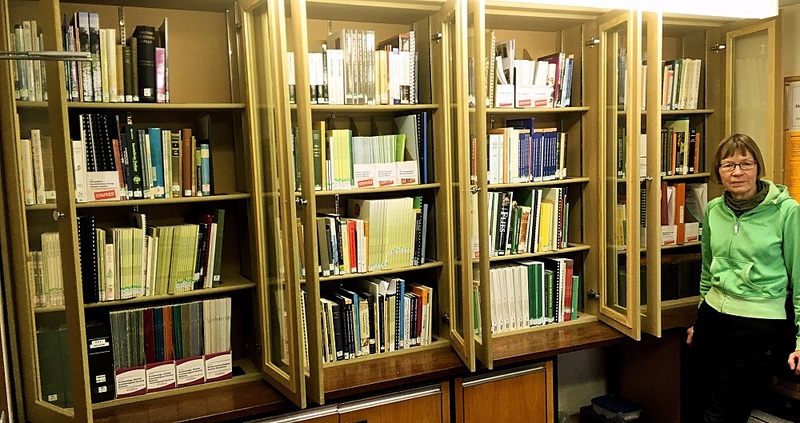 The Centre had no useable previous catalogue, so we were able to create a clean and clear new one, that incorporated the library, serial and education office collections. We used the Preston Montford catalogue as a base, to ease our task within the tight time schedule. There was some common material, but more than a half of the 1,137 titles were unique to Malham Tarn. This hints that networking FSC library catalogues could prove valuable, making staff aware of items across the whole organisation. The view from the library windows over the Tarn was seductive, as light played across the water and surrounding limestone hillsides. Our visit coincided with the mini-Beast-from-the-East, bringing more than two days of continuous blizzards, forcing snow between window frames and making the fireplace howl. The serials are kept in the Paul Holmes Room (think exclusive London club). The finely bound volumes dating back to 1837 share the glass-fronted shelves with the bar supplies, leading to a unique conjunction of real ale and the Yorkshire bird report. The prize item was a copy of Darwin’s final book, The formation of vegetable mould through the action of worms, and observations on their habits (1881). Maybe this book was justification for the retention of some older FSC library items. Even though Darwin was tired and in pain whilst writing it, the prose is clear and surprisingly modern. Earthworms are fascinating and biologically important, and he is really keen to convey this to a general, as well as a scientific audience. Editor's note: the spreadsheet cataloguing the libraries resources can be browsed below or downloaded here.